How is Man to be well-governed? How is he to govern himself? Many approaches have been tried and many more proposed. Some of these have been, in the words of a philosopher of Old Earth whom we know of only as R.A.H. , “Weird in the extreme.” None have worked; none have lasted. All have ultimately failed and usually in the most disastrous ways imaginable. 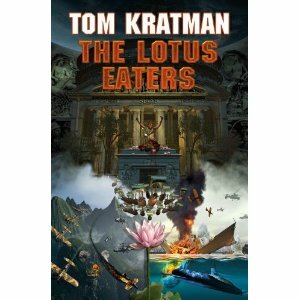 So opens Colonel Tom Kratman’s latest book, The Lotus Eaters, from Baen Books. Delving into the philosophical for a moment, this is one man I can never call “Tom” to his face. He’ll always be Colonel to me, despite assurances from unidentified sources that it is quite okay to call him “Tom”. I refuse, maintaining the officer-enlisted mentality (which may, or may not, ensure my survival). There’s a lot to be said about a man who can stare down a zombie and force it to spontaneously combust with naught but a withering glare. Beyond the norm, Colonel Kratman’s novels tend to remind one of the gritty, hard-hitting realities of life while throwing everything which can be labeled “politically correct” in your face. He’s agreed to an interview, and while many of you may or may not see eye to eye with his politics or views, one thing can be certain: he writes damn good books. And I, curse the talented man, have spent quite a bit of money on his books over the years. Me: Thanks for agreeing to the interview, Colonel. First question I’m going to ask, as it relates to The Lotus Eaters and the two books preceding it, A Desert Called Peace and Carnifex: Where did you come up with a character like Carrera? Colonel Kratman: Carrera’s existence actually arises from a question, or two of them; what kind of man would be required to do the things, and succeed in the things, he does and succeeds in, and what would spark him to do that. That was true even in the original version I wrote back in the 90s, mostly while in law school, which version wasn’t remotely science fiction. As for his attributes and talents, those are composite. Some came from me, yes. Still others came from people I’ve known. Some more came from historical characters. And one particular one, the spark of madness, came from losing his family in the way he did. There was also a fictional character, Clancy’s Jack Ryan, who is a negative part of Carrera’s make up. See, whenever I had a moral problem for him I asked myself, “What would that goody-two-shoes, failed to kill the man who shot his wife and little girl, failed to nuke the Iranian city under the full provocation of a biological attack, wimp Jack Ryan do?” And then had Carrera do the opposite. Me: So you’ve got a series which starts off similar to the September 11, 2001 attack on the Twin Towers. I know how hard that day hit me, since I’d only been out of the military for a year and had been to New York shortly before the attacks happened. When A Desert Called Peace was first released, I remember some people complaining about the resemblances. It was a difficult read for me, but it also opened my eyes to just how some people are horrible beings and others can be true heroes are in our every day life. How hard was it to write the scene where Hennessey’s family is trapped in the building right after the attack? It was, in any case, harder than you might imagine, because, while Carrera is not me, his first family is basically mine. Using them – and no, neither my wife nor daughters were especially pleased about that – was the necessary spark for me to delve into his madness. In any case, it was necessary for me to write those scenes in a way that was extremely painful, for me, in order for me to give Carrera the motivation to do what he does. Me: I would say you’ve touched on extremism of different types of Islam in your books, but that would be an understatement. One of my favorite books you’ve written, Caliphate, describes how the Caliphate of Europe came to be in the guise of tolerance and progressiveness. Do you really believe that the situation will be turning as dire as you portray it in your book? Colonel Kratman: I think it’s more likely than not that Europe will at some point in time become as I portray the Caliphate. But I can’t say it’s inevitable. As for the US turning into a nasty, genocidal dictatorship? Much of that depends on how we react to a really mass casualty, megadeath event on our soil, directed at us. As, by the way, I fully expect to happen. Me: Your first book (A State of Disobedience) was about a second revolution starting in Texas. Your following book, for me at least, was Yellow Eyes with John Ringo. I really thought Yellow Eyes was your best work until I read A Desert Called Peace. Was it difficult for you to play in somebody else’s sandbox in Yellow Eyes? Do you have any other projects in the works? Colonel Kratman: I don’t play well with others. Just ask my first grade teacher, Mrs, Skirsky, if she’s still alive. So John did up an outline for what amounts to “Mongols in Space,” under the series title: The Drift Road Wars. I tried, I really did. But in fourteen months I managed to write about fourteen thousand words, every one of which I loathed separately but equally. Note that, when I’m really going, on things I want to write, I’ve done close to a million in a year. That became Yellow Eyes and, since I could use my own story, I didn’t have the “don’t play well with others” issue. Me: So what’s coming up next, besides Countdown: The Liberators? Colonel Kratman: Right now, I’ve got several things going. I’m currently writing the follow on to Countdown: The Liberators, which is, tentatively, Countdown: M Day. Where The Liberators focused on creating a smallish military force for a limited project; in M Day that force is well established and much expanded, about to the size of a regiment, based in Guyana. Then Venezuela attacks. Yeah, one private regiment against a country, and where I am right now the regiment is getting its rear end kicked. It’s fun. Beyond that, I’ve still got to do somewhere between one and three more Posleen books, depending on whether John does one, two, or none. He’s supposed to lead on two, under both of our names. I’ve got to finish M Day and do the next one in that series, H Hour, by January. I’ve got to do another contract with Toni Weisskopf for about five more volumes in the A Desert Called Peace series, covering the defense of Balboa against the Tauran Union and then the war with and liberation of United Earth from the Kosmos (read: Tranzis). Then, too, I get pestered regularly for a sequel or two to Caliphate. And I probably will, at some point in time, write those. There are a few alternate histories I might like to do that I research as time permits, one on the civil war, one of Germany winning the First World War, and one on Hitler succeeding in conquering England in 1940. That last would be particularly fun. I call it SeeAdler: The Oxford Pledge, and pin the blame on the people who deserve it, the left and the pacifists who were Hitler’s unwitting, indeed witless, partners in crime. And then, a number of people think I should actually write the fictional book I allude to in The Lotus Eaters, Historia and Filosofia Moral (History and Moral Philosophy, a la Heinlein’s Starship Troopers). Me: Despite your rabid fan base, you still have the moniker of being a “new” author. I think that’s unfair ( no new author can piss off as many people and still get contracts if they were “new”, but I digress), but at least the folks at Baen Books have been extremely supportive of your writing. Have you had many people try to come up to you and say “We should write a book together”? Colonel Kratman: Oh, I’m kind of new, still. I didn’t begin getting hot and heavy about it until I retired from the Army, about four years ago. Since then, I’ve gotten out…hmmm…lemme think…five books. And have two more done and in the editorial queue. But I do have a pretty loyal fan base and, better still, it’s growing. It may even be growing substantially. The Lotus Eaters, while not the first time I ever hit anybody’s best seller list (I’ll never hit the NYT, I think, and not because of sales figures), was the first time I ever did so purely on my own ticket. And that was the Wall Street Journal’s, which is way better than getting hit in the face with a wet fish, no? Me: I’m not surprised. Your writing is just that damn (excuse my language) compelling. How hard is it to tell them no? Colonel Kratman: Hard, because I remember how miserably difficult and demoralizing it is to try to break into writing. But I still can’t help it; I don’t play well with others. Me: So are you going to be doing any book signings or appearances in the near future? Colonel Kratman: I used to go to cons quite often. Two things happened to interfere with that. One is that my life sort of entered the world of the surreal, almost exactly two years ago. No, I’m not going to talk about it except to say that I was somehow involuntarily enrolled in the Disaster of the Quarter Club. I’d have had, oh, two more books out, I think, but for that. That said, with disasters fading into the background, I might start up with cons again in the next year or so. Not sure which ones, though. And I have to be careful about attending in states where I can’t carry and where, disarmed, I might get lynched. Me: Well we can’t have that. Thank you, Colonel, for taking the time out of your hectic schedule to do this interview with me. Be sure to pick up Colonel Kratman’s latest, The Lotus Eaters, as well as his next book, Countdown: The Liberators, due out this coming February 2011 from Baen Books. And no one is madder than I am about “D Minus” being renamed and delayed two months. I followed the link from the Tom’s site to here. Good interview. I just discovered Him less than two weeks ago. I have read the first three of the Peace series and am now trying to get through Amazon Legion. I have picked up State of Disobedience and am looking forward to that. I will admit to being smitten with Tom Kratman and his writing. That said I’m having a tough time with Amazon but will probably finish it. I suppose I will have to wait long months until Nov  for the next in Peace. Will probably be well worth the wait, if frustrating. I hope he will release in on Kindle as I’ve become addicted to ebook reading.